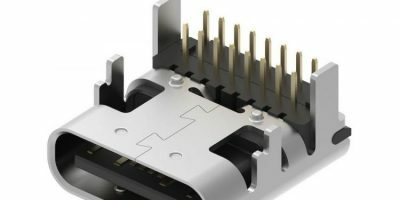 Aimed specifically at power charging designs, the USB4085 is a USB Type-C connector released by Global Connector Technology (GCT). Since its introduction four years ago, developers have been exploring the feasibility of using USB Type-C. Its fast charging capability, small size and reversible form factor make it attractive for development engineers, integrating it into consumer technology, such as headphones and speakers which are moving to wireless data transfer. GCT points out that the additional cost of the PCB receptacle has been a barrier. Working closely with engineers, GCT developed a charge-only version. By sacrificing the SuperSpeed differential pair contacts, eight in total, the modified 16-pin construction of the USB4085 Type-C provides all the required full charge capabilities with streamlined USB 2.0 functionality. It gives engineers the option of improving the charging capability of a design at an affordable price, says GCT. The USB4085 is available in a through-hole mount type. There are four PCB retention/grounding posts to provide extra strength and integrity on the board. The USB4085 has a 3.46mm height above PCB and is rated to 10,000 mating cycles. Resources available include 3D models, product drawings and PCB layout/footprints, making it easier and quicker for engineers to design in.